Here’s a shot of Large windmill clusters in the Mojave desert, California. Scroll around a bit and you’ll see there’s lots of them. Also quite cool in the East of this shot there’s a collection of what I’m assuming are spare blades for the windmills. Just for the heck of it – here’s a shot from Patterson Pass Road, of the windmill farm of the Altamont pass. Those are way too big to be spare blades…I think you are seeing a stockpile of the “towers” that hold the windmill blades. 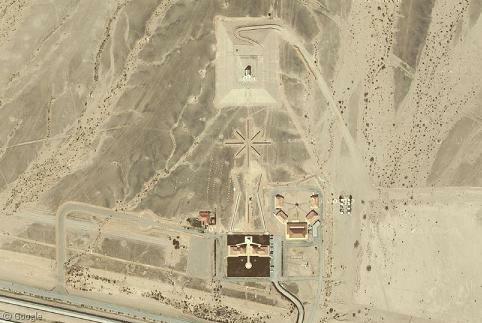 Just found another stock pile of towers/blades near the palm springs area…Now I’m not sure. The blades look bigger than I thought. From the size I thought they were bodies too, but why on earth would they have spare bodies? The blades are the most likely parts to need replacing! I suspect that these are decommissioned bodies. The windfarms in California are old and not worth fixing when they break. This is definately the case in Altamont where as the windmills fail they are replaced by much smaller numbers of larger, newer windmills. if you pan out over to the nearby airport (east by southeast) you can see a few SR-71s. Though it was interesting. I don’t see SR-71s, just a bunch of old commercial planes and possibly some old fighters. Got a centered link? The turbines in the shot are in the Tehachapi Mountains, a few miles from where I live. The planes jeremy saw are at Mojave Spaceport (home of SpaceShipOne); there’s a storage area for “excess” commercial airliners on the north side. Who own these windmills in california? So i was wondering what one Windmill would power! i saw these going to Vegas and saw on a very small town, and figured the hundreds of them could power much more!